Do you want to catch fish in Alaska? Then you are in the right place. Strike Zone Sport Fishing has the best captains and guides. 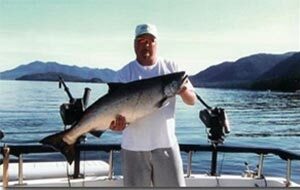 We deliver a quality Alaskan fishing experience. Fishing is a passion. It is our passion. And we want to share the it with you. Are you ready for an awesome Alaska experience? Luke is the owner and operator of Alaska Strike Zone Sportfishing. 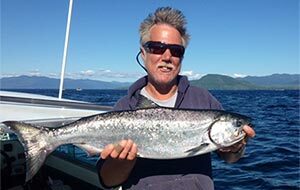 He is a second generation charter boat operator and has spent his entire life in Ketchikan, AK, honing his fishing skills to provide top-of-the-line fishing trips. He started working in the fishing charter industry as a deckhand at the age of 9 for his father, Lewis. He has over 27 years experience as a USCG licensed Captain and has over 35 years of experience fishing the pristine waters surrounding Ketchikan, Alaska. With his passion for sport fishing and sharing it with others, he has grown Alaska Strike Zone Sportsfishing into one of Ketchikan’s premier charter services. Bill is originally from Oak Harbor WA, but he has made Ketchikan, Alaska his home for the last 40 years. Bill works for us part time, when he is not working on the Alaska State Ferry. He has been fishing in Southeast Alaska for over 25 years and takes great pride in his ability to put fish on the deck. Alex is from Kalispell, Montana. 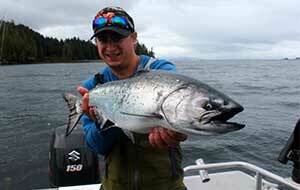 He joined the Alaska Strike Zone team last season as a Deckhand on the Island Time. He has worked very hard and we are proud to announce that he has recently completed his USCG License. Alex has a natural instinct for catching fish, and you will experience a top notch fishing experience aboard his fishing vessel. Capt TJ is from Mountain Arkansas. He has an extensive list of experience fishing fresh & salt waters in Northern California, so guiding in Southeast Alaska only made sense. 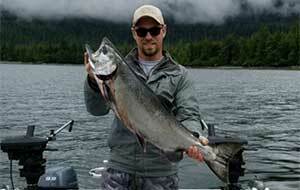 He is fishy and his drive and love for fishing is what brought him to Ketchikan, Alaska. This is his second season guiding, and we are happy to have him on our team! Maria runs the Alaska Strike Zone office. She is the one most likely answering your emails and calls. She is here to give you information or to answer any of your questions you might have while booking. 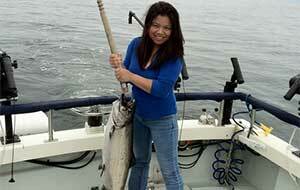 Luke and Maria share a passion for fishing in particular, The Ketchikan King Salmon Derby.